In the corner of a warehouse turned Italian market a short walk from Elephant and Castle station, surrounded by fresh pizza, steaming mugs of mulled wine and pop-up chasing hipsters lies the entrance to the Winter Night Garden. A large bookcase emblazoned with titles we all mean to get round to reading stands aside a majestic mahogany wardrobe; I look around for Mr Tumnus. Swapping my online booking code (gold dust, at the rate the tickets sold out) for an old school movie stub, a pretty young lady draped in a fur-trimmed red velvet cloak ushers us through the wardrobe doors and into a secret tunnel of fairy-light adorned trees. The effect is quite literally breath taking and I look around in awe as I step gingerly across the forest floor, ducking to avoid fur tree branches. The foliage breaks to reveal an opening in the enchanted forest, where cosy beanbags sit side-by-side. Tickets are priced and sold by section, and we arrive early enough to secure front row seats; the usual cinema-fears of neck ache are not an issue here as you can slouch and wiggle your way to squidgy bean bag bliss. The bar serves festive themed cocktails, as well as a range of beers, sweet smelling mulled things and mince pies, and I just have to order an espresso martini in a Santa shaped mug. Whipped cream forms his staple white hair; he is an instagrammer’s dream. Before the film begins Bing Crosby fills the screen, and the room, with the melodies of White Christmas, ending in a snow foam canon display which rains down on the audience. Despite having seen Elf countless times before, it is somehow that bit funnier and more festive in this extraordinary setting. We laugh louder than usual at jokes we can recite in our sleep, and when New York’s Christmas spirit helps Santa’s sleigh to fly, I tear up. This bit is nothing new, I’m a massive cry baby and festive films always tip me over the edge. Not usually in public though…I leave feeling as enchanted as the twinkling forest, full to bursting with Buddy’s festive enthusiasm and ready to take on December. The 16.50 a ticket is easily justified; it’s little more than a film at one of the soulless big name cinemas in that big central square named after a midlands city and the experience is so much more magical. 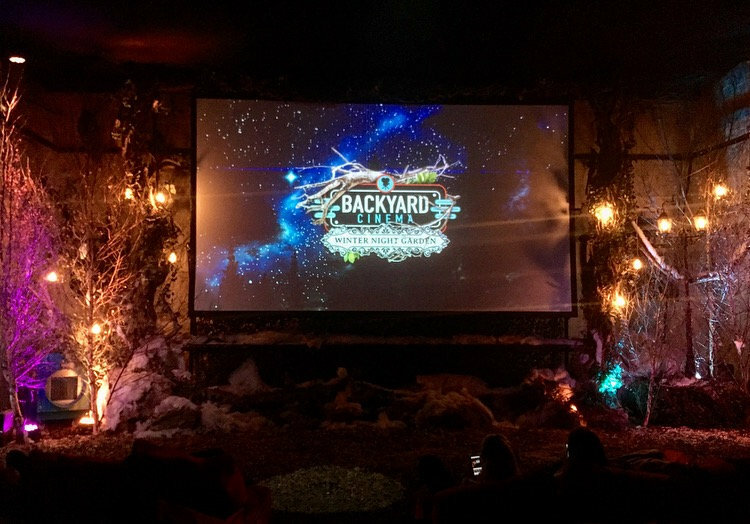 It might be too late now to catch a festive flick, but fear not, Backyard Cinema’s will be returning with ‘The New Year‘; a showcase of movies from Grease, to Mean Girls, to Dirty Dancing – classics designed to ward off the January blues. Tickets sell out incredibly fast, so grab your girlfriends for a night out with Regina George, or plan the ultimate date night.